Is your health insurance plan cancer-proof? If you're diagnosed with cancer today, will your health insurance be enough to help you fight this disease? Or would you need a cancer-specific insurance plan? Cancer is one of those topics that is disagreeable for most people. Yet it must be addressed because it is often swept under the carpet simply because it is unpleasant to talk about. For this reason, every 4 February is observed as World Cancer day, and it aims at spreading awareness about the dreaded disease. According to cancer prevention experts, there were a little over 14 million cancer patients in the world in 2012. This is estimated to balloon to more than 24 million by 2035. The scariest part is, you could be the next victim. A cancer-related study, prepared by consultancy EY (formerly Ernst & Young), has found startling facts about cancer and how it is impacting Indians. Only 30% of centres have advanced imaging technologies for accurate diagnosis, cancer staging and response monitoring. Most of these are the top seven-eight cities. Indian women are most susceptible to breast and cervical cancers, and Indian men to head, neck, lung and gastrointestinal cancers. Another major problem in India, says EY, is low awareness. Most people are ignorant of the toll that today’s high-paced lifestyle takes on the body; they forget cancer can strike anyone – anytime. Usually, when people first learn that they have cancer, the reaction invariably is one of shock; and the most natural question that comes to mind is, ‘why me’? It is normal to feel overwhelmed and confused, but there is also a lot to learn and think about. Talking with your doctor and learning about the types of treatment can help you feel more in control. There are many types of cancer treatments, some more well-known than others, such as Chemotherapy, Radiation, Immunotherapy, Targeted therapy, Hormone therapy, Stem cell transplant and Precision medicine. The types of treatment that you need will depend on the type of cancer you have and how far it has advanced. Some cancer patients may require only one surgery or treatment. But in most cases, cancer patients will have to undergo a combination of treatments, such as surgery with chemotherapy and/or radiation therapy. This is basically a measurement of how much the cancer has spread. Based on this, your doctor will decide what treatment you need (e.g. local treatment like surgery or a wider area treatment like chemotherapy). Referring to data collected in 2009-11, EY says that in India, only 20-30% detection across all types of cancers is in Stages I and II, which is less than half of that in the US, UK and China. 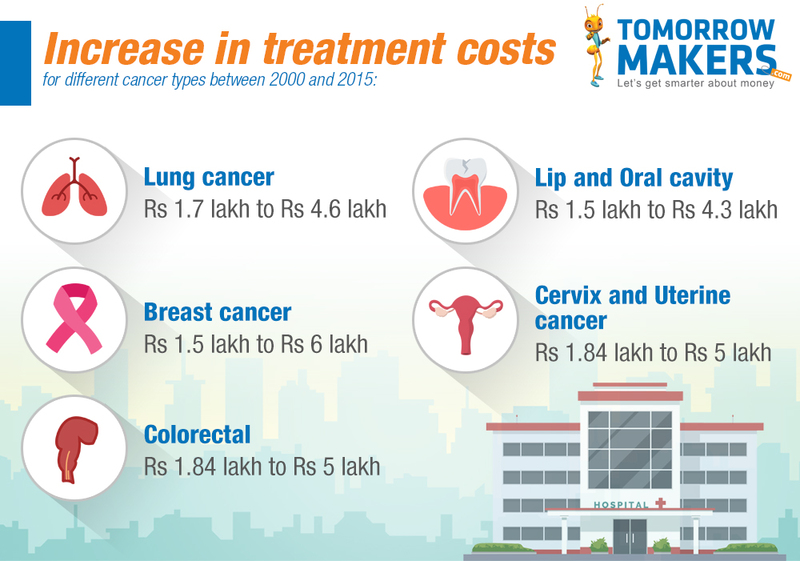 Late detection of cancers in India is impacting both, survival rates and cost of treatment. While mortality rates are four to six times higher than the US, treatments frequently leave the victim’s family severely crippled, financially. If detected early, and if income loss is excluded, the baseline costs to treat this disease can amount to about Rs. 3-4 lakh, but it is still higher than the annual income for over 80% of households. Costs frequently can reach Rs. 20-50 lakh, and affected families are often forced to sell assets. It all boils down to one question– Is your health insurance cancer-proof? Given the astronomical costs, it is a good idea to get a cancer insurance plan, even if you have health insurance. This is because a health policy may be inadequate when it comes to extensive treatment costs related to hospitalisation, chemotherapy, radiation, surgery etc. A health insurance plan may only pay for your hospital expenses. A dedicated cancer insurance plan, on the other hand, can offer you a lump sum payout in case you are diagnosed with cancer, which you can use for all your needs. Additionally, it is more affordable than a regular plan as it covers just one disease. So, you can get a cover of about Rs 40-50 lakh for less than Rs 2,000 annually. Of course, this depends on factors such as age, gender, period of policy cover etc. A cancer-specific plan or critical illness insurance plan is broadly divided into two stages: early-stage cancer and major-stage cancer. An early stage cancer insurance pays you a part of the sum assured (generally 20-30%), while in a major stage diagnosis, the policy will pay you 100% of the sum assured. A basic health plan may need to be renewed after every year or two. This is where a cancer insurance plan is more beneficial, as it is available for longer periods (e.g. 20 years). So, while your health insurance premium will increase as you grow older, a cancer plan premium will remain constant, making it more economical for you. Most cancer insurance plans also cover smokers, although at a higher premium, and also provide cover for all kinds of cancers, except for skin cancer. Some policies also waive premiums if a policyholder is diagnosed with the disease. The best part is, you are not required to submit bills; a diagnosis report from an authorised medical practitioner suffices, and your insurer will bear the entire eligible claim on the basis of that.